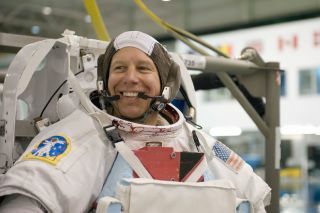 NASA astronaut Tim Kopra, attired in a training version of his Extravehicular Mobility Unit (EMU) spacewalking spacesuit. HOUSTON – The NASA astronaut who lost his spot on the space shuttle Discovery's final flight because of a bicycle accident radioed his comrades in orbit today to say he's with them in spirit. Walking into Mission Control on crutches, astronaut Tim Kopra radioed the six astronauts on the shuttle from NASA's Johnson Space Center here to congratulate them on their smooth launch. Discovery blasted off yesterday (Feb. 24) from the Kennedy Space Center in Florida. "I just wanted to tell you guys you all had an awesome launch and we're all very proud of you down here," Kopra said. Kopra is a veteran spaceflyer who lived on the International Space Station for months on his previous flight. He was tapped to serve as the lead spacewalker for Discovery's current STS-133 mission to the space station, but was injured last month in a bicycle crash. NASA ultimately replaced Kopra with another accomplished spacewalker, veteran astronaut Steve Bowen. "Great to hear your voice, Tim, I wish you were here," Discovery's commander Steve Lindsey said. "I appreciate the good words, it was a great launch. I can't tell you how much we wish you were here with us as well." "Well, I'm sure you know I feel the same way, so I definitely feel like I'm there in spirit and I'm especially looking forward to seeing Steve and Al go out the door and do great work," Kopra said. In today's cosmic call, Kopra also got the chance to speak to the other members of Discovery's final astronaut crew. "Hi, Timmy," said mission specialist Nicole Stott. "I just want to say I love you and like Steve said, we wish you were here. But we're also very happy you'll be supporting us from the ground and I look forward to talking to you on EVA days." "Love you back and it's going to be a great couple of EVAs," Kopra replied. "Hey Tim, it's Mike," astronaut Michael Barratt said, then he shared an apparent inside joke. "We've missed your booming zero-g laughter up here and I'll have to tell you, you're hearing in a little bit more than spirit, but we'll have to explain that when we get back." "I'm looking forward to that, Mike, it's great to hear your voice," Kopra said. And as a closing touch, astronaut Steven Robinson in Mission Control ended the conversation with a final thought: "All right, Discovery, just goes to show you have a seven-person crew, they're just not all up there with you." Discovery's crew is flying an 11-day mission to the International Space Station to deliver a new storage room and humanoid robot to the orbiting laboratory. The shuttle will arrive at the orbiting laboratory tomorrow (Feb. 26) at 2:19 p.m. EST (1919 GMT). You can follow SPACE.com Staff Writer Denise Chow on Twitter @denisechow as she covers Discovery's final space voyage from NASA's Johnson Space Center in Houston. Visit SPACE.comfor complete coverage of Discovery's final mission STS-133.